The "dog days" of summer have come and gone. But that doesn't mean it has to end!!..... Actually it does. 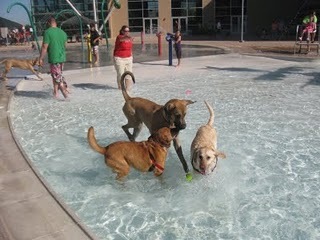 Bring your dog for the once-a-year swim in the outdoor pool before it is closed for the season. Sorry, owners aren't allowed in the water. WHEN: September 11th, @ 10am to 2pm!! We hope to see you all there for a fun time at the splash pad. Our pups had a ton of fun last year and can't wait to go back. So our August caught us by surprise!!! We had a wonderful, yet busy August. It seemed to come and go so quickly..... Unfortunately we missed our monthly dog of the month "spotlight," we will continue it in September, so be sure to check it out. We will be "spotlighting" Shiloh a spunky catahoula mix. Also we have finally joined the crowds of people on Facebook, so be sure to catch up with us there!!! !